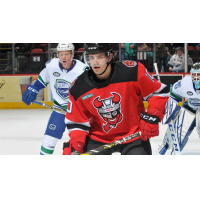 BINGHAMTON - Nick Lappin scored a hat trick and Cam Johnson made 22 saves in a 4-1 victory for the Binghamton Devils over the Utica Comets in front of 4,216 fans at Floyd L. Maines Veterans Memorial Arena on Saturday night. After no scoring in the opening period, the Devils kicked off the scoring 2:08 into the second period while on the power play. Ryan Murphy fed Blake Pietila for a one timer from the dot and the rebound kicked out to Lappin in the crease. Lappin pounced on the puck and fired it into the open cage to give the Devils a 1-0 lead. The Comets tied the game 1:40 later on a similar goal to Lappin's. Utica fired an innocent looking shot from the point that bounced its way towards the net. Johnson made the save, but the rebound went straight to Kyle Thomas who shot the puck into the open net. Vincent Arseneau and Jamie Sifers assisted on the goal for Utica. The Devils regained the lead with 5:24 remaining in the period courtesy of Lappin's second goal of the night. On a delayed penalty, Binghamton set up in the Utica zone with the extra attacker. John Ramage launched a slaps hot towards the net and Lappin deflected the puck past Michael Leighton from the high slot. John Quenneville earned a secondary assist on the play. The Devils were unable to score on a pair of late power plays and the score remained 2-1 heading into the final period. Binghamton kept the pedal to the floor in the third period, outshooting Utica 20-4 and keeping the play out of their own defensive end. The Devils were able to add an insurance marker with 1:49 remaining as Lappin completed the hattrick. Murphy's point shot leaked through Leighton and Lappin was there to jam it into the net to give his team the 3-1 lead. Pietila added another assist on the goal as well. Nathan Bastian would add an empty netter to secure the 4-1 victory, and snap the Devils four-game losing streak. The Binghamton Devils return home Tuesday to host the Syracuse Crunch at 7:05 p.m. in the rescheduled game from January 19 due to weather. Students can get tickets for just $5! Call or text "TICKETS" to 607-722-7367.